Please note that we use the ANSI/NEMA FL-1 system to determine the Candela and Distance of all our lights as this is becoming the Industry standard. We have yet to see any of our competitors that sell mainly hunting lights use the ANSI system. We feel this is because they don't want to give you a even comparison with their lights to ours because they just can't compete with our lights. If they did use it, you will easily be able to see how much further our lights shine. Please note that while our lights will shine the distances we give below, the distances you can actually see the entire animal is going to be less but they will light up the animals eye's past the distances we give below. The reason for this is because Humidity, rain, clarity of the air, how well your scope does in low light and other conditions will all effect how far you can see to Identify and the yardage numbers below are in perfect controlled conditions. Any company that lists a specific number on how far you can identify animals with their lights is just throwing numbers at you because there is no way the can know because they don't have your eyesight, they don't have your scope and they are not hunting in the same conditions you are. This is why we list the distance our lights shine and the Candela because they are both facts, not some made up numbers. As a general rule of thumb, you will be able to identify at about 1/2 to 2/3 the distance a light shines depending on your equipment and field conditions. For example, if a light shines 600 yards, you should be able to identify somewhere between 300 and 400 yards. Please note that we included the Mini-Sniper, Destroyer, 30LR, 50LR, and 66LR lights below so anyone that has one can compare the numbers to the new lights. The Mini-Sniper, Destroyer, 30LR, 50LR and 66LR have been discontinued. 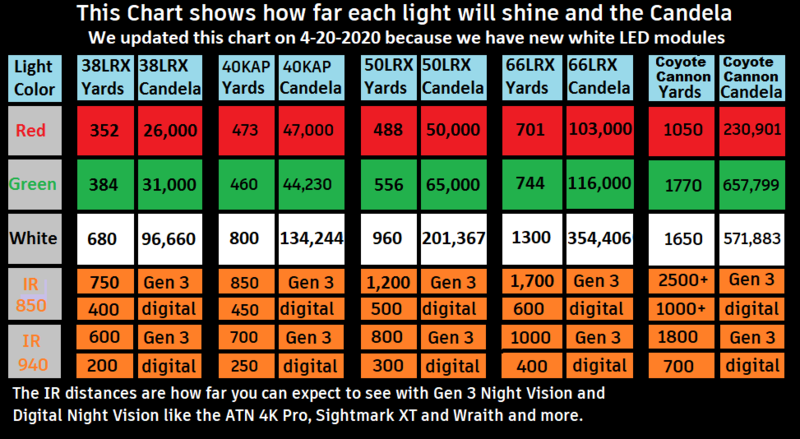 Please note In the first chart below you can see how far each of our lights will shine with our New LED X modules, in the second chart you can see how for our lights shine with our old LED modules that came with those lights. shine with our New LED X modules, in the second chart you can see how for our lights shine with our old LED modules that came with the lights. We don't use the ANSI system to determine the amount of lumens our lights put out because the equipment is just too expensive. We use the LED manufactures numbers on lumens based on the drive current on our lights and it should be really close. When looking for a long range light, lumens doesn't mean much anyway, it's much more important to know the Candela as this will tell you how far a light will shine and lumens will not. The reflector/lens has a lot more to do with how far a light will shine then the lumens. Just look at the numbers above as all our lights have the same amount of lumens in each respective color but each uses a different reflector/lens and this is what focuses the light down range. Below is a brief description of the ANSI system so you can see how we arrive at the numbers above. On August 18, 2009, the American National Standards Institute (ANSI) approved a new specification standardizing flashlight performance. The standard was developed by the Flashlight Standards Committee of the National Electrical Manufacturers Association (NEMA). The committee consisted of a number of flashlight manufacturers. The resulting specification is called ANSI/NEMA FL-1. As with many technical specifications, the full standard can only be purchased from ANSI or NEMA. The purpose of the standard is to allow consumers to make apples-to-apples comparisons of lights and to eliminate exaggerated light performance. The tests can be performed by the manufacturer or an independent lab. The necessary equipment and calibration makes this an expensive undertaking. Total lumens of output, measured in an integrating sphere after the light has been on for 30-120 seconds. 30 seconds gives a little time for the LED to get hot and the battery voltage to sag which will usually result in a lower output number. The amount of continuous runtime (in minutes) until the light output drops to 10% of its original value (measured 30 seconds after turning the light on). This test is done using the batteries included with the flashlight. If no batteries are included, the test is done using the manufacturer-recommended batteries. The test is done in an integrating sphere just like the lumen test with light output measured every 15 minutes. 10% of brightness probably gives inflated runtime numbers. In the past, some testers used 50% to be a little more practical, but with most batteries, the drop-off is usually pretty quick and the time between 50% and 10% usually is not long. Light intensity in candela (cd) at the brightest part of the beam. A lux reading in the brightest portion of the beam is taken at some distance (2m, 10m, or 30m) with the light on its brightest mode and tightest focus at some time between 30 and 120 seconds of turning the light on. The lux reading is multiplied by the square of the distance in meters to get candela. Regardless of the distance at which the reading is taken, you should end up with the same value in candela, therefore the measurement is independent of distance. A lux reading taken at 1 meter distance is the same as candela (since 1 squared is 1). The distance in meters at which the flashlight produces a light intensity of 0.25 lux. This is not very bright, about equal to a full moon. This distance is not actually measured. Instead the value is calculated by taking the peak beam intensity measured above, dividing by 0.25 lux, and taking the square root of the result. For example, the Sniper Hog Lights 66LRX with a Red LED has a peak beam intensity of 103,000 Candela. Divide this by 0.25 to get 412,000. Now take the square root to get 641.87. Now if we round that up it comes out to 642 meters or 702 yards. IPX4 "Water resistant" Light can be splashed with water from all directions without water getting inside. IPX7 "Water proof" The light can be submerged in 1 meter of water for 30 minutes. Water can leak into the light, but not into areas with electronics or batteries. The light must still operate when removed from the water and then is tested again 30 minutes after being removed. IPX8 "Submersible" The light can be submerged for 4 hours to some depth greater than 1 meter. The depth would be specified, e.g. IPX8 10 meters. Realistically the light is not put in the given depth of water, but instead is completely submerged in a container and the pressure is then increased to simulate the depth. Height, in meters, from which the light (including batteries) can be dropped onto concrete without cracking or breaking and still function. Lights are dropped while in the Off position and allowed to come to rest before inspecting for damage. For ratings over 1 meter, each sample light is dropped six times with different faces towards the ground.